We are the ISO 9001:2008 certified manufactures and exporters of UPVC Reducer. The reducers offered by us are used for reducing pipe size from large to small bore. Being a client-centric organization, we are engaged in manufacturing UPVC Reducer. 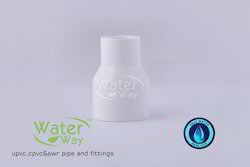 We offer high quality u-PVC Reducer, which are used for reducing pipes form a larger dimensions to a smaller dimensions. We are offering UPVCBrass Reducer to our clients. - Size: 25 x 20 mm. We " Polymer Marketing Corporation " are leading supplier of UPVC Reducer and providing to our customer in best quality. 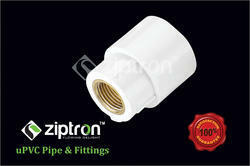 We are offering UPVC Reducer to our clients. Internal Diameter: Up to 1"
Available Sizes: 3/4"x1/2", 1"x1/2", 1"x3/4", 11/4"x1", 11/2"x1", 11/2"x11/4", 2"x1", 2"x11/4", 2"x11/2"
With sincerity and hard work of our professionals, we have carved a niche for ourselves in this domain by providing a premium quality gamut of UPVC Reducer. We are offering UPVC Reducer to our client.